DATE PALM (Phoenix dactylifera) is a highly nutritious fruit. It is rich in sugar, iron, potassium, calcium and nicotinic acid. One kg fully ripe fresh ripe fresh dates provide approximately 3,150 calories. The flesh of dates contains 20% moisture, 50-65 % sugar, 2.5 %fibre, 2 % protein and less than 2% each of fat, minerals and pectic substances. Thus, date fruit can help supplement the dietary needs of desert people where very few nutritive foods are available. In California, diced date, date paste and sugar are manufactured for use in break fast and bakery. The leaves of the palm also have potential for use in the manufacture of paper. Date palm is very exacting in its climatic requirement, which according to an Arab saying should grow with its feet in running water and its head in the fire of the sky. The successful cultivation of date palm requires a long summer with high day as well as night temperature, a mild winter without frost, and absence of rain at the time of flowering and fruit setting with low relative humidity and plenty of sunshine. It is estimated that finest date varieties require 3,300units of heat (base 10`C) for full maturity of its berries. The heat unit summation must occur from pollination until full maturity of berries. This period should be rainless and dry. This is in contrast to its native home in Mediterranean region where summers are dry with rainy winters to allow fruit development from May through September –October. In Indian subtropics, fruiting period is confined only from February-July whereas ripening period coincides with rainfall. Therefore, fruits do not reach ripening stage and should be harvested at earlier stage of fruit development. Deep, sandy loam soils ideal for maximum water–holding capacity and good drainage are desirable. Date palm can grow in alkaline and saline soils but in such soils its growth and productivity are greatly reduced. The soil profile should be free from stones of calcium carbonate concretions and hard pan at least up to 2 m depth. Date palm tolerate high soil salinity ( pH 8-10). It can survive in soils having 4 % salt concentration, provided the root system does not come in contact with a stratum of soil where the sodicity is more than !%. An early cultivar, suitable for raw eating and processing as soft dates. Tolerant to rain. Fruit small to medium, oblong with rounded apex and yellow at doka stage. TSS 25.5-42.2% and astringency in fruit at doka stage low or almost absent. A is comparatively dwarf-and mid-season cultivar. Fruit matures slightly later than Halawy. Small to medium, oblong-ovate and greenish-yellow at doka stage. Mid-season cultivar, slightly tolerant to high humidity. Fruit is medium to large, oblong-oval and yellow at doka stage with faint longitudinal streaks of red near the base. A late-ripening cultivar, it is suitable for preparation of dry dates. The fruit is large and broadly oblong- oval to somewhat ovate, orange-yellow with a fine reddish-brown stippling and highly astringent at doka stage. The seed has ridges. A mid season or late cultivar. Fruit small to medium, ovate to nearly round, golden-yellow and almost free from astringency even at green stage. Hard ripe doka fruits very sweet and suitable for raw eating. A mid-season and prolific–bearer, variety, slightly tolerant to rain or high humidity because of smooth and hard surface. Fruit small to medium, ovate and yellow, astringent at doka stage. Fruits are suitable to prepare soft dates. It is a mid-season cultivar. Fruit small to medium, oblong oval, yellow and sweet at doka stage, has an oblique base and irregular outline. It is suitable for raw eating and for processing as soft dates. This grows wild in the mid hill region of the North West Himalayas and is a very multipurpose tree. It has been described under the chapter “Wild date palm”. Date palm is propagated by off- shoots (suckers) emerging from the base of the palm. Since plants raised form seeds not only bear inferior quality fruits but almost half of them may be non-bearing males. The off shoots could be separated from mother plants 4-5 years after planting. Thus, 8-20 off shoots of 8-15 kg size can be obtained during its fourth and tenth year of life and none therefore. This is obviously a slow rate of multiplication. Absence of a fast multiplication technique for date palm is thus a prominent bottleneck in its extension of area. About 30 million offshoots are required to cover 0.3 million ha area in the arid north-west region. 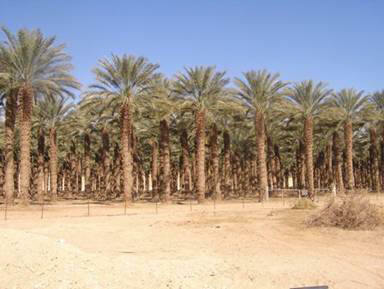 Although, tissue-culture technique has been standardized in date palm, its commercial use is still constrained owing to variation. Prior to the removal of offshoots, the outer leaves are cut back to two thirds of their lengths and the inner leaves to half. The stalks of the pruned old leaves are tied together to protect the tender apical growing bud. It is ensured that offshoots have well –developed root system. The offshoot separated by cutting the connection with the help of a sharp chisel in such a way that no injury is caused to the mother palm. The copper fungicidal paste should be applied to cut end of the off shoot. Research is in progress to induce rooting to establish small sized off shoots and to induce more number of off shoots/ palm. Application of IBA to small offshoots before removal from mother palm and then putting them in mist is quite effective in footing and survival percentage. The other vegetative them methods- cutting, grafting, budding and layering are not successful. Date palm is a perennial tree and bears fruits for 40-50 years. Therefore, adequate planting distance is very essential. In general, planting is done at 8 m distance between rows and plants in square system, which facilitates intercultural operations and proper development of the palms. A total of 156 palms are accommodated in one hectare. Since it is dioecious, 10% of these must be raised by planting male offshoots to provide adequate pollen-grains. The field should be thoroughly ploughed, leveled and pits of 1m x1m x 1m size are dug during simmer. They are kept open for about a fortnight and refilled with a mixture of garden soil and well decomposed farmyard manure. Care should be taken that the crown of the planted offshoots remains at least 10-15 cm higher than the ground level so that the irrigation water does not touch it or enter into it. Young offshoots should be protected against intense heat and low winter temperature for at least 2-3 years by providing partial shade. Rainy season (July-September) is ideal time of planting. Sufficient number of green leaves is necessary for growth, development, and yield. Insufficient number of leaves results in low quality fruits and lesser inflorescence in the following spring. About 75-100 leaves are in Khadarawy, Zahidi, Barhee, and one to every 8-9 leaves in Halway, Deglet Noor and Dayri. Further, 12 leaves/ bunch is optimum leaf-bunch ratio in Barhee dates. Optimum yield and good quality fruits could be obtained with 8 active leaves /bunch when 5-8 bunches/ plant are retained. The old and senescing leaves should be pruned. Time of leaf pruning is June. It is better than in February. To facilitate pollination and subsequent handling of bunches, the spines from the leaves around bunches are also removed in the late winter to early spring. Date palm is highly cross pollinated due to its dioecious nature. In commercial plantation, mechanical or hand pollination is done. 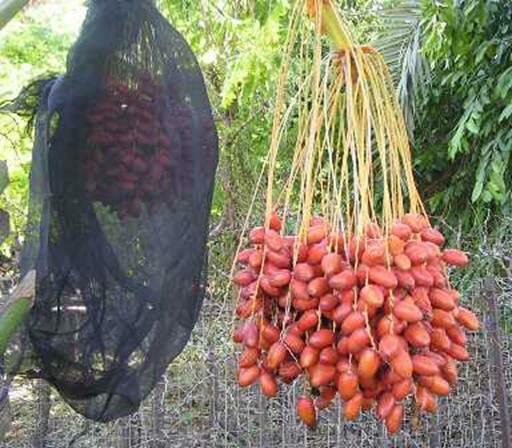 For this, 2-3 male trees are enough to pollinate 100 female palms. About 2-3 strands of male flowers are inserted between the strands of female flowers. Since metaxenia is common in date palm, selection of a good pollenizer is important. The quality of date fruits, particularly fruit size and time of ripening are influenced by pollen. Under Indian conditions, early ripening is desired to avoid losses due to rains. If the male spathes open earlier than female, the pollen is dried and stored for use at a later date. Dried pollen containing about 10% moisture can be stored satisfactorily with calcium chloride at room temperature for 2-3 weeks. It can be stored until the next season in refrigerator at about 4`-5`C. However, fresh pollen produced the best fruiting, followed by that with refrigerated pollen and pollen stored at room temperature. Trailor mounted palm dusters are used in USA. When pollen dust is used, dusting has to be repeated 2-3 times. In India, spathes generally emerge during February-March and the flower opening starts during March-April. Although stigma of female flower remains receptive for several days, it is better to pollinate the inflorescence as soon as they crack open. Fruit thinning is necessary to ensure adequate flowering in the following year, to improve fruit quality, prevent delayed ripening and reduce compactness and increase ventilation of the bunches. Thinning can be done manually of by chemical sprays. Manual method is common which involves removal of some bunches or strands from each bunch or shortening the length of strands. The number of fruit that a palm can sustain depends on variety, age, vigour and number of green leaves. Three to four bunches/palm is recommended from fifth year onwards. In India 8-10 bunches are left on each palm. The best results are obtained by removing one third strands from the centre of the bunch. However, in long stranded variety, Deglet Noor , shortening of the strands is also necessary. Plant growth regulator ethephon is an effective fruit thinning agent. It provides additional benefit in inducing early ripening of berries. This is of great significance in India, as harvesting of fruits before the onset of rains is advantageous. Ethrel at 500-1,000ppm encourages early ripening. Nutrient application is important for satisfactory production of quality dates. A dose of 30kg N, 20kg P and 50 K/ha should be applied. However, in India, application of 1.36 kg N/tree is necessary. Manures can be applied in the beginning of winter season and the fertilizers in March/ April. However, an adult tree should be fed 600 g N, 100 g P and 70 g K per year. The application of K and P should be monitored according to soil conditions. Application of 12.5 -35.2 tons/ha of farmyard manure is beneficial. In areas where irrigation facilities are available, intercrops can bring handsome returns. Preference should be given to lentil, gram, peas and senji in winter and mash, green gram (mung) and black gram for summer. Suitable vegetable crops can also be taken with adequate Manuring. Small- sized fruit trees like pomegranate, phalsa and papaya can also be grown between date palm. However, under such conditions, additional requirements of water and nutrients for the intercrop should be provided. Irrigation is very essential in date palm because it is grown in hot and dry, low rainfall areas. Further, the water requirement of date palm is high although it can withstand prolonged droughts. Date palm likes wet feet but is damaged under prolonged stagnation. In high water table areas, 4- 6 irrigations in a year may be adequate. Light and frequent irrigations must be given after planting. Mulching may be useful at this stage. In sandy soils, irrigation may be given everyday or on alternate days. The frequent irrigations is reduced after the offshoots have established which is dependent on soil texture and weather conditions. About 10- 12.5 acre cm of water is required to grow palms where the soil is dry during ripening and 6-8 acre feet where heavy water is continued throughout the year. Mulching with black polythene or available organic mulch materials like date palm leaves or weeds in the basin helps conserve moisture and increase irrigation interval. The dates are eaten at different stages of maturity depending upon the varieties and thus harvested at different stages according to local demand, customs and climate. In India where maturity coincides with monsoon, fruits are harvested at ‘doka’ stage to avoid spoilage due to rains and high humidity. Spraying of Ethephon (1,000ppm) at color break stage is recommended in Gujarat to advance maturity. Under Mediterranean climate, they are allowed to ripen fully before harvesting. It is stored after drying. Fruits for fresh eating are preferred at ‘Dang’ stage but handling of such fruits is difficult. Date palm trees usually take approximately 6 years for commercial bearing yield is comparatively less during initial years but it increase with age. On an average, 50 kg doka fruits are produced from each palm of 10 years age increasing to 75 kg at the age of 15 years. However, the yield also depends upon variety, cultural practices and other factors. The dates harvested at doka stage have 70-80 % moisture. They have very poor keeping quality. Therefore, these fruits should be marketed soon or may be cured or processed. Since Doka or dang fruits cannot be stored for future use, curing should be done. Doka fruits are successfully processed to prepare Chhuhara. The technique involves boiling fruits for 5-10 min. Depending on cultivar and then dehydration, in solar dryers or in air circulating ovens at 48-50 C for 70-95 hr, the doka fruits can also be artificially ripened to bring them to the final stage of maturity by dipping them in boiling water for 20-25 seconds and then dehydration in oven at 38 C-40 C.
The date juice and sugar have been successfully utilized as sweetening and flavoring agent in ice cream. Recently attempts have also been made to can date pulp and khalal fruits in 20-40% sugar syrup. A satisfactory pickle is obtained after 6 weeks of pickling green fruits treated with 15 % sodium chloride and 2% acetic acid.